This photo of 1879 shows the first location of the Post Office in Wyndham St.
Lost to the town: Once holding architectural pride of place in the main street was the colonial Victorian Post Office of 1882, sadly demolished in 1973. The Shepparton News covered the story of the Post Office being demolished back in 2006. Click here to read the story. In 1853 there was a depot established for receiving mail. This depot was part of a three-roomed hutment, and was under McGuire's superintendence near the old punt which he owned. Successive punt owners conducted this service on similar lines. Long after this it was run as an office for sorting, receiving, and handing out mail, as well as for the sale of stamps. So primitive was the conduct of the office that it was seldom open at as late a period as 1873 unless one looked up the licensee of Fraser's Hotel, then at the rear of the present Shepparton Hotel building. It was conducted at this period by Matthew Sutton. 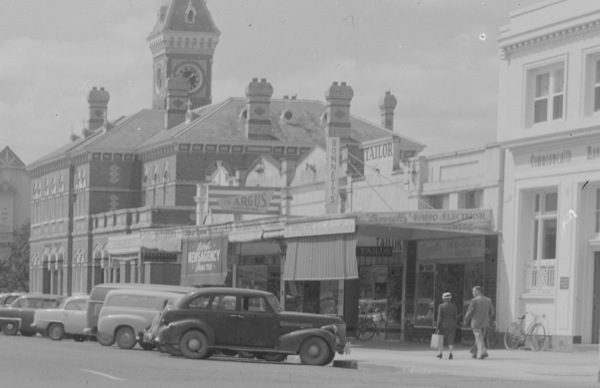 This arrangement was very unsatisfactory, and as free settlement came in the seventies with its increased business, the post office was established at Mr. A. F. Rowe's store, on the site where the Commonwealth Bank now stands. Mr. Rowe was actually the first official postmaster, and the office was now conducted on sound business lines. Mr. Rowe managed the office in conjunction with his business until 1880. 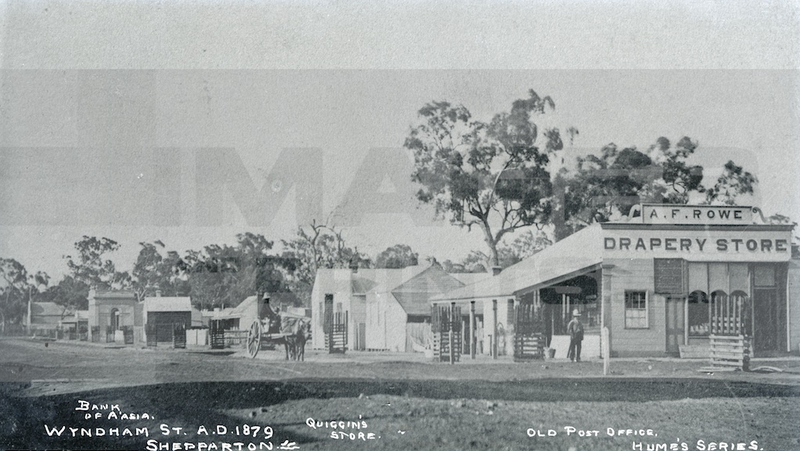 A photo of Rowe's store and post office, dated 1879, is still in existence (see above), the office being a separate room of the building. 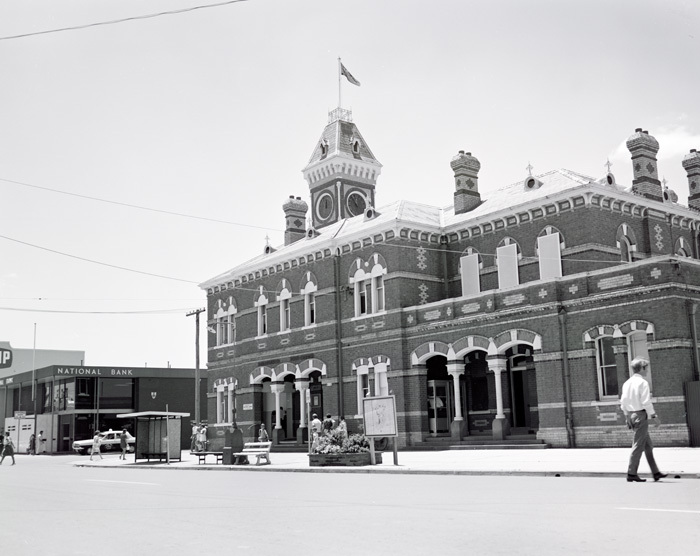 The next post office was conducted in the brick building in Wyndham Street, north of where the Bank of New South Wales is situated, and was opened in 1880. Mr. Cathie was appointed in place of Mr. Rowe, who had resigned. It is to be observed that at this time, the Telegraph Office was still retained in Rowe's building, Mr. Cathie being the operator as well as postmaster, and apparently he travelled to and fro to transmit and receive messages at stated periods. 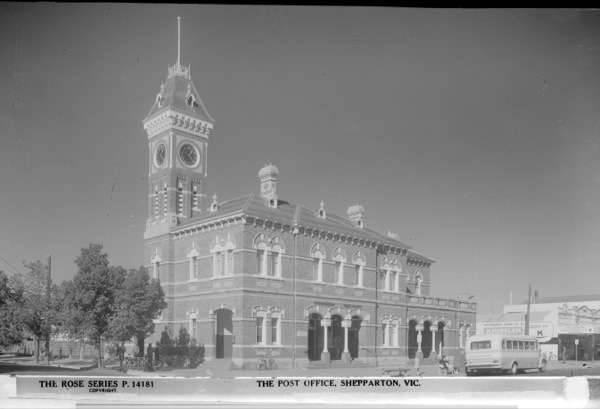 In 1876, there was an agitation in Shepparton for a post office to be erected by the Government. The Government had reserved an area of land where the Presbyterian Church stands for this purpose. This site did not meet with the approval of citizens and feeling ran high in the town. This was because the new site at the time was altogether out of the town, Welsford and Wyndham Streets being the main business centres. Mr. Fraser had land where the post office now stands and this site was generally favored; indeed, Fraser himself was keen to have this site chosen. There was opposition of a sectional nature by landholders adjacent to the site originally chosen by the Government. The Government, however, desired to accede to the wishes of the predominant party led by Fraser, but excused themselves that there was no corner block vacant, much as they would like to build the post office in Wyndham Street. Fraser was a far-seeing Scot, who owned considerable land on the east side of Wyndham Street, and quickly found a solution. He offered to open a street from Wyndham Street to Maude Street, so that the Government could have a corner block. This offer was accepted, and Fraser Street was opened accordingly. A copy of a diagram taken from a certificate of title is in the possession of the Borough Council, having been handed over by the Hon. Richard Kilpatrick, M.L.C., he having obtained it from the Secretary of Lands. The area concerned is as documents show: "One acre two roods 16.75 perches of land which was transferred in February, 1882, to her Majesty the Queen, by Mr. William Fraser, senr., of Shepparton, for use for public purposes." 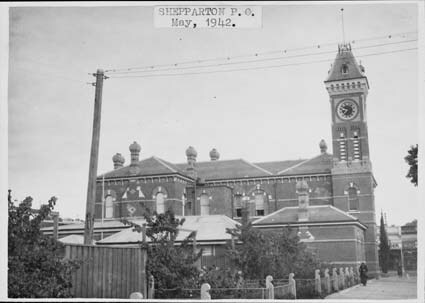 This area was transferred as a gift for the erection of public offices at Shepparton, and the nominal consideration as mentioned in the transfer was ten shillings. The present post office and law courts were erected on this site. The foundation stone was laid in 1882, and in 1883 the buildings were completed and opened for business. The postmaster was Mr. St. Ledger. From 1880 until the Telegraph Department was established in the present buildings. (Previous references have been made to telegraph matters.) However, from 1883 until twenty years ago, telegraph and telephone matters steadily developed with the town's progress. Electrical engineering activities naturally played an important part in such development. 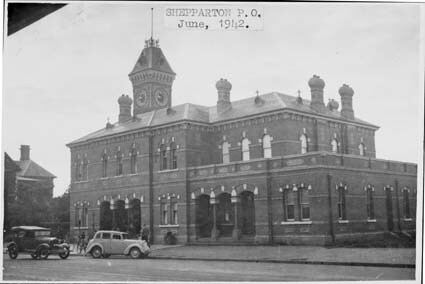 But more rapid progress took place as Shepparton became established the "Capital City" of the northern parts of the State, and it was asserted in 1934 by the chief representatives of the Telegraph Department that Shepparton had progressed more than any other town in this respect in recent years. foreman mechanic with a staff of mechanics in addition to the mechanics who were given charge of various towns in the valley. In the succeeding five years, the telephone networks expanded to such an extent that in many cases one exchange reached almost to the adjoining one.